On night two of SxSW 2012, I acquired a sidekick (or perhaps I was the sidekick, I don’t know). 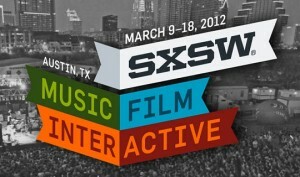 In recent years, I have been fortunate to have an accomplice for my SxSW adventures. It has, however, never been the same person from year to the next — leading me to wonder exactly what it says about me that no one will brave a festival with me twice. This year, Doug, a friend of mine from the coffee shop where I go to write about music and in general escape reality, had bravely agreed to join me for the remainder of the festival. A relatively recent transplant to Austin (from Pennsylvania via Athens, GA), Doug is a serious a music fan; with both Austin and Athens under his belt he has some pretty serious live music cred. I was fortunate to have him along as someone off whom I could bounce ideas and observations. I would need it … we were in for a strange night. Our first destination was Spill, a pleasant if somewhat indistinct venue along Austin’s main drag for entertainment, Sixth Street. When I had found a listing for a bluegrass band from Quebec on the SxSW’s Wednesday night schedule, I was immediate intrigued. Montreal’s Canailles has an extensive and highly diverse line-up, including a vocalist, piano accordion, washboard player (using spoons, rather than a metal whisk – for extra authenticity points), standing bass, drums and two additional instrumentalists, both who appear to alternate between guitar and banjo. As they begin their first number of the set, it becomes clear that, while “bluegrass” is not exactly the wrong term for Canailles’ music, it does not paint the full picture. Rather, their sound appears is polymorphous folk rock that borrows heavily from bluegrass, traditional French Canadian and other influences — including lyrics entirely in Quebecois French. Their first song captures that feel and sound beautifully: a fast folk-rock laden with bluegrass and mountain influences. The instrumental bridges are rollicking and, with so many artists on the stage, seem to practically lift the band off the ground. Lead singer Daphné Brissette’s voice is high, raspy, throaty and filled with energy – like a belle from the Golden Age of country music. She is not alone in the vocal spotlight, Canailles makes great usage of group vocals, a technique anchoring their sound in the territory of folk rock. And, like many folk-rockers, Canailles are high-energy performers, who love swaying and dancing around on stage as they perform. Their third number is another fast-paced, round-and-round folk rock number. Though, for folk rock, it possesses less of an organic feel and a more formal division of parts than many examples of the genre. Banjo and accordion drive the melody, drums and washboards supplying rhythm and bass and guitar holding a place somewhere in between. Great accordion solos and beautiful use of supporting vocals really make the number stand out. I am, to say the least, a little surprised when a large segment of the audience spontaneously erupts into a line dance. Apparently, this is an aspect of Quebecois folk music as well, “Much as Texas has a lot square dancing,” as explained by one band member. When I became a roots music journalist, I made a solemn vow that, no matter what, I would never become involved in a line dance — and I remain true to my oath this evening. Their fourth song rolls out with a slow introduction showing little of bluegrass influence in their early numbers. The number is powered by some beautifully intricate banjo work. It is vocals, however, that really make the number. Brissette’s voice is a sublimely powerful minor-key wail, reminiscent of a soprano Janis Joplin. When backed by the rest of the band on supporting vocals, the effect is impressive—exotic, even haunting. At the song’s mind-point, Canailles drastically accelerates the tempo, led by furious guitar work, before dialing it back again until an explosive finale. Crashing bass and accordion work provides dramatic, almost dissonant flourishes as the song builds to its true climax. The next song begins with a martial-sounding drum tattoo before being joined by the rest of the ensemble —with the accordion’s full sound place front and center. Accordionist Alice Tougas-St. Jak takes lead vocals on the number, revealing, in addition to her instrumental prowess, a beautiful, soaring voice. Compared with the folk-rock orientation of the first part of their set, this number brings a much stronger Nu-grass or even alt-country flavor. At the beginning of the sixth song of their set, Canailles plays tribute to their mandolin player, who was unable to make the performance (If I understand correctly, he lost his passport on the way to the airport). This is a tragedy for the audience as well as the band. Even as they are, Canailles has a stellar sound but it is easy to imagine how the strains of the mandolin would elevate their sound to the proverbial “next level.” . And it is an apropos song to dedicate to a mandolin player, a wild number, filled with sounds drawn from mountain and (again, to my untrained ears) Cajun music as well as a few parallels with early rockabilly. The song includes a memorable duet between guitar and banjo. The rockabilly accents were especially fascinating on the accordion, filling out the band’s sound much as a country ensemble might use a trumpet. Their lead guitarist also takes on lead vocals for this number. It is a beautiful, rough-hewn voice. Calling it “gravely” doesn’t do it justice — it is solid granite turned into commanding sounds that avalanche through the venue. Canailles’ final song begins with as a duet: accordion on melody and washboard on rhythm. It is, quite frankly, one of the best folk-rock or roots duets I’ve ever heard. Brissette returns to lead vocals, with the rest of the ensemble lending powerful support. Again, to my ears there is a strong Cajun sound but, again, I am probably just misreading the Quebecois influence. The song ends with some great banjo plucking — even the Appalachian masters couldn’t do better. Just five years ago, Austin’s Rainey Street neighborhood was a quietly moldering if charming little area. Now, this residential area just southeast of downtown in Austin’s newest hotspot, dotted with houses converted into creative, casual open-air restaurants, food trailers and bars that combine the selection of an upscale hipster hangout with the relaxed atmosphere of a neighborhood watering hole. Among these is Clive Bar, site of the showcase for Richmond, Virginia’s Goldrush. Why Goldrush? Over the years, there have been many alleged fusions of rock/pop music with classical music. Most of these are simple transpositions of the songs of one genre to the instrumentation and style of the other (Giving us, in one direction, The Trans-Siberian Orchestra and its ilk and, in the other direction, innumerable mediocre albums of symphony orchestras playing Beatles Songs). Goldrush offers a truer form. They are the first band of which I am aware that has succeeded in a more subtle alchemy — musicians who have seamlessly blended classical instrumentation and aesthetics into solid indie-pop. The band’s composition underscores this aesthetic. Lead singer Prabir Mehta also wields electric guitar, Treesa Gold plays violin, Matt Gold offers a powerful performance on standing bass while Gregg Brooks handles percussion. The Golds are classically trained musicians with symphony cred, while Mehta and Brooks are veterans on the rock and indie sets. Their first number begins with a long violin solo by Treesa Gold: wild and dark, firmly entrenched of the realm of what is often (and overly simplistically) referred to gypsy music). The full band enters with smart, well-crafted indie pop. Mehta has a smooth, engaging voice that is well suited to indie vibe of the music. Reinforcing this band’s unusual music tool kit, Matt Gold plays his bass with bow, something I’m not sure I’ve seen previously at a rock show. Goldrush’s sound already displays the intriguing fusion that drew me to their showcase: rock-laden guitar and drums while the bass and violin filling out the bands sound with dignified classical strains. Outside of melodic rock and a few other niche genres, it is rare to find a violin in a rock band that is being played like a violin, and it is truly wonderful thing to watch and hear. As they play faster and harder, their indie-pop crosses over that nebulous line over into indie rock and even makes brief forays towards pop-punk. These are delicious words to write about a band immersing themselves in furious violin playing and frenetic drum crashes, alternating with slower musical and vocal interludes — as if giving the audience time to catch their breath and reflect on the music. Individually, the band’s members are turning in impressive instrumental performances. Mahta is a skilled indie rock guitarist. Later in the number, Treesa Gold puts a little funk on the violin (yes, I’m pretty sure that’s the first time I’ve written those words together). Matt Gold pulls off a beautiful rock bass solo (again, played on standing bass using a bow). All of this is punctuated and underscored by the strong sounds of Brooks drum kit. Watching them jam, witnessing them actually pull off the coveted classical/rock fusion — and hearing that the result is a beautiful thing, not just some novelty, but a wondrous thing to behold. Their second song begins with some nice vocal work by Mehta. Initially using smooth, even tones approaching spoken-word, he later injects tonality and even a little contra-tenor. This alternation continues throughout the number, switching between smooth, precise spoken-word and conventional, variable-pitch singing … adding another layer to the performance. Again, the band is very much in indie-pop territory, including polished radio-friendly lyrics such as, “Tell me baby, what you know. I’ve been waiting here.” Goldrush is a delight to watch, much tighter performers than your run-of-the-mill rock band. Towards the end of the song, the Mehta puts some real power and even a little growl into his pipes. He has already shown himself to be a fine vocalist, but this is one of his strongest performances in the showcase. Their next number is titled, “Tonight” and kicks off with a strong alt-country vibe. In fact, with lyrics like “Five days ago was the last time I saw your face. I’ve been sitting here alone and I swear I’m never leaving this place,” it’s pretty damn close to a drinking song. “Tonight” features solid instrumentation all the way around but, appropriately for its alt-country aesthetic, the guitar is the real instrumental star of the number. Also in keeping with that flavor, Matt Gold puts down his bow and does some nice plucking. The following song, possibly titled “If You Want Me,” begins with elegant work on violin and bass, very heavy on the classical flavor this time, before being joined by drums and guitar. Mehta is joined on vocals by Treesa Gold and Brooks, giving their singing a fuller, heavier presence. The furious and dynamic violin work on this number is one of the highpoints of their entire set, and Gold’s playing drives the rest of the band throughout the song. Even as Goldrush dials back the volume and tempo mid-song, it is the violin overlay that crowns the piece. Their sixth number features a strong guitar introduction and very solid drum work from Brooks throughout. The song incorporates some classic rock and alt-country elements, juxtaposed with some beautiful, pop-esque “woo-oo-hoo” on vocals. This is a powerful song, radiating raw energy and great changes in volume between chorus and interludes. Ensemble vocals support Mehta’s dramatic cooing and whooping, further enhancing the classic pop elements of the song. And it does seem to be a number which Goldrush’s lead guitarist/lead vocalist particularly enjoys—he is a ball of energy on this number, jumping around stage as he plays guitar, epitomizing the high energy of the entire ensemble. It is clear, that whatever their instrumentation or training, they are first and foremost rockers at heart. Their set concludes with a number called, “Two Wrongs and One Glorious Right,” which Goldrush dedicates “to the great state of Texas.” It is a number that goes beyond alt-country to an impressive blend of old-time country and old-school rock and roll—like a Sun Records recording with a violin thrown into the mix, driven by high volume vocals and great rock and roll guitar to match. From the almost serene streets of the Rainey Street neighborhood, Doug and I push rapidly north, back to the densely populated insanity of Sixth Street: Austin’s perennial ground zero for nightlife and the epicenter of SxSW. Our destination is Friends, a venue serving as temporary headquarters for an Oklahoma music showcase. A four-piece from the university town of Norman, The Boom Bang offers high-volume punk, garage and surf music … with a strong accent on the punk. After our long walk from Rainey Street we, again, miss the beginning of the showcase — walking into an almost packed-to-sardine-capacity crowd as The Boom Bang is in the midst of a classic three-chord punk acoustical assault that sounds like it flows from some long-forgotten underground NYC punk club of the early 80s. Guitarist Tommy McKenzie is in the midst of throttling the neck of his guitar, forcing it cry “uncle” with a classic rapid-fire punk sound that alternates with great high-octane shredding. Singer James Smith has a voice well cut for punk. It is, in fact, more than a little like that Joey Ramone. In fact, with a mop of hair flying down over his eyes to the bridge of his nose, Smith’s overall image is rather reminiscent of Joey Ramone. Thinking along those lines, it’s also easy to hear Johnny Ramone’s influence on McKenzie’s guitar playing. Of course, lest we forget that this group is from Oklahoma, a video backdrop inexplicably projects images of gazing bison behind the band. The next two songs are very much akin to the first, classic East Coast punk pieces with an especially strong debt to the Gabba Gabba Hey boys. With the fourth number we witness, The Boom Bang breaks away from a Ramones-esque first generation punk sound, presenting a deeper, more sonorous sound that is more characteristic of later generations of punk as well as the band’s garage and surf influences. It is also a more elegantly crafted piece than their first offerings, with gradual tempo changes and more inflection on the vocals. With the fifth song, The Boom Bang returns to the classic punk with a number brimming with rapid-repetition guitar work, heavily punctuated staccato lyrics and weird vocal wailings. Their next song (called “Shaq Sabbath” or possibly “Shaq Stabbath”) is a new song for the band and another number that breaks out of a classic punk mold. It begins with some airy, almost prog rock guitar work interspersed with strong metal chords before returning to their native punk. The drumming of Charles Whetstone and uncompromising bass of Weston Lorence, by contrast, reflects a lot of garage rock, bordering on old-school rock and roll. As the song progresses, McKenzie’s guitar even adds a little surf and speed guitar to the mix, showcasing some impressive and flexible guitar chops. One hesitates to use the word “nuanced” for a band like The Boom Bang. I’m not sure how’d they’d take it (and no one wants to get shivved by an angry band in the alley behind Sixth Street during SxSW) but there is definitely a more complex side to them — a willingness and ability to pull together threads from multiple musical styles and weave them together in a single song. For the final song of their set, The Boom Bang returns to the punk rock that seems to be there true center of gravity, accentuated by Smith physically exploding off the stage and into the crowd — running around the crowd singing into his remote mic. He then ups the ante by singing the final verse of the song while crowd surfing. In spite of the garage, surf and other elements that they bring into the music, two things make it hard for me to think of The Boom Bang as anything other that a classic East Coast punk band that happened to be born a couple of decades too late and half a continent away. First is their performance style, which shows 100% punk rock heart. It is to their credit that, on a stage about the same size as a station wagon, they are trying to give their audience the full visual experience of punk rock — jumping around, twirling their guitars while still playing, slinging the microphone around, etc (And, if there was no mosh pit, I suspect that was only because it was physically impossible for enough people in a venue that crowded to move around at once). Second is the manner in which The Boom Bang interacts with their fans. Smith would indeed introduce each song. But due to a combination the band’s punk aesthetics and the acoustics of a venue that, to be honest, is shaped like a subway tunnel with wooden paneling, all I really heard was incoherent screams and the occasional curse word. And, for punk rock — is probably all I really need to hear. And that, my friends, is punk rock. The Boom Bang is a young band, but one that is already pays worthy homage to the early trailblazers of punk music. If this band stays together, I will be curious to hear what they sound like when they have truly found their own voice. Feeling vicariously exhausted merely by having been in the presence of The Boom Bang show, we decide it is time to take a break and grab some dinner. About a block up Red River Street we encounter a large open lot thronging with people, a dozen or so food trailers and two stages — one of which is graced by an ensemble of men producing a truly remarkable amount of noise. 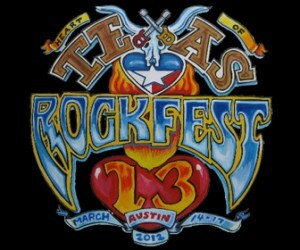 This is Texas Rockfest. Not formally affiliated with SxSW, Rockfest is one of the oldest and most well established of the festivals occurring in Austin parallel to SxSW. Now in its 13th year, Rockfest has become an institution it its own right, specializing in music from rock’s harder and faster corners, and drawing its own devoted crowd. After procuring a bratwurst-in-a-bun loaded up with sauerkraut and brown mustard, we settle in to enjoy the delicious metal-leaning rock stylings of Austin band, A Good Rogering. I am initially confused about the purpose of the two stages, next to each other, with only one occupied. The purpose and wisdom of this arrangement becomes clear as, during the final songs of A Good Rogering, a second band begins setting up on the adjacent stage. In this manner, Rockfest loses almost no time due to the need to break down after one band and set up for the next. Very smart. The following band is Dead Earth Politics, an Austin-based metal/speed metal outfit that makes A Good Rogering sound like a leisurely stroll through the gardens of ambient pop. After enjoying a few songs of their blistering sonic assault, it is time to move on to the next official item on the evening’s agenda. From the packed confines of The Boom Bang and the “up to 11” sonic assault of Texas Rockfest, it was time for a change of pace – Driskill Hotel, one of Austin’s oldest and most elegant lodgings, and its performance space, the Victorian Room, easily one of SxSW’s most comfortable and richly apportioned venues. Americana, alt-country, country and even blues – and there is some truth to all of those monikers. A simpler and more revealing description, however, is that Forsyth epitomizes the Austin sound, which is predicated on the idea that country, blues and rock are all points on the same continuum and that, if what you’re playing doesn’t have elements of all three, you’re doing it wrong. Forsyth’s performances range from acoustic solo work to playing with large ensembles. For his showcase at the Victorian Room, he fronts a five-piece featuring Oliver Steck on accordion, Jeff Botta on bass, Nina Botta on drums, multi-instrumentalist Matt Smith and, of course, Forsyth on guitar and vox. The ensemble begins their showcase with “Captain,” a great roots/folk number. In the fine tradition of old Southern spirituals, “Captain” is ripe with four-party harmony, minor chords and lead vocals that simultaneously tremble and soar. Instrumentation is minimal, a slow, simple bass drum to provide beat, supplemented by clapping and stomping. Forsyth’s voice on “Capitan” is irresistible – righteous, soulful booming tones that sound as if they spring from a dusty old of 78rpm side by a long-forgotten Mississippi gospel group. With the second number of the set, “Bring Back the Heartache,” Forsythe and his ensemble shifts gears. With a title like that, it’s little surprise that this is a good old fashioned country-rock number. “Bring Back the Heartache” features great country-rock guitar, with some nice rock and roll hooks on the solos. The rest of its instrumentation is of a piece with the guitar: energetic, enthusiastic drums and a rousing electric bass line. Forsyth’s vocals, tones both clear and sonorous, are also in a country-rock style but delivered in an oddly calm, even fashion juxtaposed with the instrumental energy erupting all around. Dedicated by the band to “all the musical veterans,” as a song “Bring Back the Heartache” is at once a sincere tribute to musicians and a distinctly non-idealized and non-sentimental description of the musician’s life. Musically, from its fast-paced beginnings, the song mirrors the message of the lyrics—as glitz and glamour give way to gritty reality. “Bring Back the Heartache” gradually winds down to a slow, delicious a cappella finish. “Can’t stop your heart from falling to pieces. Can’t stop a lover from running away. On the following number, the band reverses course yet again with a number that straddles the line between country rock and gutbucket blues. Forsyth’s guitar work is a perfect “10” on the Austin scale: southern rock, outlaw country and Texas blues all at once. The band’s performance is rowdy yet tight. At times each musician is going full-force simultaneously. Sharp, strident vocals match the feel of the guitar playing while some amazing electric mandolin really sticks the Americana into the number (though Smith’s mandolin work is occasionally overpowered by the collective force of the ensemble). The entire acoustic package is tied together and driven forward by the guidance of Nina Botta’s thundering drumming before concluding with a tempest of slashing guitar chords from Forsyth. The fifth song, “105” leads off with harmonica, rain-stick and heavy electric bass. Once in full force, the song reveals itself as outlaw country, played with the beat and style of jump blues. In addition to the memorable lyrics, “105” is a strong number musically. Steck’s accordion work is nothing short of glorious while, between versus, Forsyth turns in some passionate, fiery harmonica. Changing direction again, the ensemble moves to a slower song “Things That Matter” which, like the previous number, treats a serious topic —but does so in a more somber and sincere fashion than the “105’s” tongue-in-cheek satire. “Things That Matter” is a song Forsyth wrote in memoriam for the late Steve Bruton. A friend and musical collaborator of Forsyth’s who passed away in 2009; Bruton was a veteran musician who worked with artists ranging from Kris Kristofferson to T-Bone Burnett to Elvis Costello. “Don’t give me diamond rings or the so-called finer things. “Things that Matter” offers some of the finest guitar playing in a set filled with memorable picking. And the song’s emotion-packed chords seem to linger in the air around the stage. The sixth number of Forsyth’s set, “Red Dirt” begins with four-part vocals that, much like the first song of the showcase, draw strongly on Southern a cappella traditions. The number also stands out for an impressive compositional move. Foreshadowing is, of course, a fundamental part of country and blues lyrical storytelling. But it unusual to encounter a song where lyrics directly foreshadow musical changes. Here, opening with the lyrics, “Found a little seed in the red dirt, baby. How you going to make it grow?” the song leads into a smart alt-country with very strong Red Dirt County influences. It also features an ample crop of warm, fuzzy earthy-crunchy Austin country lyrics, such as, “We want a word where we’re all connected. We want a world where no one is neglected.” In “Red Dirt,” the ensemble presents us with another number of remarkable instrumentation: unabashed rock and roll guitar work, a great duet between guitar and accordion and a venue-shaking gutbucket instrumental breakdown during the final interlude. A live performance by Guy Forsyth and his band is to experience a show that is at once the zenith of the modern “Austin Sound” and the apogee of progressive alt-country/Americana. Only a veritable living legend could have torn me away from the Victorian Room before the end of Forsyth’s set. As it turns out … one was about to perform. John Rebennack, Jr., known to the world as Dr. John, is the one of the reigning monarchs in long line of New Orleans roots pianists stretching back through Professor Longhair and beyond. In a career that stretches nearly 60 years, Dr. John begun as a session musician in the Big Easy. Hard as it may be to believe, he begun his musical life as guitarist. Defending a fellow band member in a fight, Dr. John sustained a gunshot would to the hand that ended his guitar career – but apparently in no way hindered him as he made the transition to the ivories with which his name has become instantly associated. As a pianist, Dr. John pioneered a personal and deeply eclectic style of roots that blends elements of rock, blues, New Orleans jazz as well as even boogie-woogie, Cajun and even zydeco. As much as his prodigious musical talent, Dr. John’s transformation from session musician to front man and musical icon was a result of his energetic and highly theatrical stages shows, a la Screamin’ Jay Hawkins or Alice Cooper, that often played upon the Voodoo and occult elements of the Big Easy’s reputation. Performing at La Zona Rosa, a converted warehouse that is among the larger SxSW venues, Dr. John’s reputation has clearly preceded him. The spacious venue is packed back-to-front and shoulder to shoulder, not only with SxSW diehards but hundreds of “civilians” willing to pay the cover change to see a musical master at work. Dr. John’s band is a large one and well equipped to cover any genre of roots music, including an electric bass, guitar, drums, baritone saxophone, keyboards, pedal steel and, of course, Dr. John himself on electric piano. The show gets under way as the bass player grabs the microphone and rolls out with, “Aw yeah, put your hands together for Dr. John.” The normally restrained, and sometimes downright difficult, SxSW crowd is immediately enthusiastic in its response. The band plunges into “Right Place, Wrong Time.” Released in 1973, the song was a rock-and-roll crossover hit and one of Dr. John’s most commercially successful numbers. It is also well chosen for his current audience. The song featured prominently in Richard Linklater’s 1993 film, “Dazed and Confused,” a celebration off all things 1970s Austin. His voice is one of the most distinctive in music: a fierce, gravely and almost feral baritone somewhere between the tones of The Big Bopper and Wolfman Jack. As performed at La Zona Rosa, Dr. John spins even more funk on his electric piano than on the standard radio version of “Right Place, Wrong Time,” with some funky guitar to match, as his vocals ooze mellow Big Easy charm. The guitar work and solid bass line are a nice back-up to Doctor John’s playing – with some bari sax giving the number hard-hitting artillery punctuation. Their second song, “Revolution” picks up instrumentally where “Right Place, Wrong Time” left off – with fabulous and powerful yet intricate work by the baritone saxophone. It is a dark rootsy, jazzy number anchored by a bari sax so swinging that, aside from its pitch, I might assume it was a tenor. In between vocals, Dr. John coaxes his trademark beautiful, funky electric piano sound from they keys. But, on this number, the master may possibly have been upstaged – as my attention is drawn again and again to one of the best bari sax players I have heard in a very long time. The third number, “Ice Age,” begins with an introduction that verges on free-form jazz as the ensemble’s instruments all seem to be exploring their own musical space—with especially nice explorations of tone by the bass and guitar. Again, the lyrics are a kind of soft, poetic roots-rap, “KKK, CIA – all playing the same gig,” as Dr. John’s takes the audience on a stream of consciousness journey through a litany of his social commentary. In the second half of the song, Dr. John puts the emphasis back on his piano playing and the ensemble returns to their jazzy flights of acoustical fancy at the conclusion of the song. Whatever the extent of the gunshot injuries that drove the good doctor from guitar to piano, they clearly don’t prevent him from playing a damn fine axe for a song or two. On the fourth song in his set, “Loop Garoo,” Dr. John picks up his guitar and starts belting out some good, solid roots licks with a strong, confident hand that would be the envy of many musicians who make the guitar their primary instrument. “Loop Garoo” is one of Dr. John’s classic dark Louisiana-Gothic numbers, brimming with local occult flavor and hoodoo flourishes. Even the title of the song (alternatively spelled “Loup Gauro” “or Loup Garu”) is a reference to the werewolf analogue in French (including Cajun French) folklore. Musically, Dr. John’s strong guitar work is supported by powerful drums while keyboardist John Clearly is a credible stand-in as he sits behind the doctor’s electric piano. Returning to his piano, Dr. John introduces the next number as, “A new-ey but a true-ey.” Hailing from Dr. John’s recently released album, “Locked Down,” the tune is called “Big Shot.” It is a delightfully tongue-in-cheek commentary on the cult of personality within the music business (“I’m a big shot. Never going to be another big shot like me.”) and perhaps even offers a little self-deprecating humor about his personal status as a living legend. In addition to the obligatory phenomenal solo piano work, “Big Shot” also features a memorable duet between Dr. John and the saxophonist. The six song begins of Dr. John’s set begins with an interesting bit of vocal percussion as the band does a series of fast guttural exhales in unions, with the bassist finally shouting “Everybody scream!” to the audience. This song, the name of which I did not catch, is good old-fashioned soul music that sounds like it came fresh from a Stax Record songwriter. If features some soaring vocal and instrumental chords, but it is the funky bass and guitar work that really makes the number — concluding with a guitar solo of such unassailable funkafied it would make Skip Pitts proud. After another funky guitar intro, this one blended with some great electric blues, Doctor John invites the audience to put their hands together for the seventh song in the set. Heavy on long instrumental sections, it really showcases Dr. John’s mastery of the keys as well as displaying some great guitar and sax work by the rest of the band. The eight song *may* be a rendition of Dr. John’s classic “Gris-Gris Gumbo Ya-Ya” with significantly revised lyrics —or it may be a song with which I am unfamiliar. Either way, it opens with strong sax and jazz guitar. Dr. John’s vocals return to the rich, gravely spoken-word roots-rap he showcased earlier in the set. “They call me Dr. John. I hail from down in the bayou,” he proclaims while doing a funky hipster strut around the stage. The song’s instrumentation is a break from previous numbers in the set, with elements of roots and prog blended into the stellar guitar work. Once Doctor John returns to his keys, the song is driven to a frenetic climax by a crowd-wowing performance on the piano, thundering drums and the prog-accentuated guitar chords. The final song of Dr. John’s showcase begins with a crazy little piano solo that summons to mind images of some possessed carousel or demented carnival … before moving into a classic, swampy Louisiana roots sound dominated by Doctor John’s fancy keyboard work and the thunderous strains of the baritone sax. Performances by iconic artist such as Dr. John can sometimes have the strange subtext of an unspoken tug of war between musician and audience. Most audiences prefer to hear that which is classic, seminal, popular or just plain fun from a musician’s catalogue. Musicians themselves, understandably, often wish to share their newest creations and promote their latest offerings. Critics exist, uneasily, somewhere in the middle – and never has that been clearer to me than at the Dr. John showcase. Professionally, I was excited to get a foretaste of “Locked Down” and see what the good doctor has been up to recently. But I would be lying if said my heart hadn’t been hoping for more of his gritty roots-rock and R&B mainstays. That having been said, it is always inspiring to see a living legend at their craft. Day two concludes with a serendipitous bookend. Having begun the evening with sounds steeped in the folk music of French Canada, it would end with the Quebecois’ counterparts from the other end of a damn big river and the lively musical strains of Louisiana’s bayous. Hailing from Cajun Country’s unofficial capitol of Lafayette, The Lost Bayou Ramblers have emerged as a major force in contemporary Cajun music. I have previously covered them at The Ponderosa Stomp, New Orleans’ annual celebration of all thing roots music, where they backed several of the greatest names in the history of Cajun music, including Harry Anselmi, Leroy Martin, Vin Bruce and DL Menard. I have seen them perform solo as well and the Ramblers are always a welcome addition to a night of music. Performing with a standing bass, electric guitar, acoustic guitar, fiddle, accordion and drums, the Lost Bayou Ramblers launch quickly into their trademark brand of highly danceable, feel-good Cajun music— all delivered with some serious rock and roll attitude. The vocals are of a piece with the band’s overall sound and aesthetic, sung in Cajun French but delivered with rock and roll punch. Announcing the band’s distinctive origins, the accordion clings to a purer Cajun sound than the ensemble as a whole. This is The Lost Bayou Ramblers’ approach to contemporary Cajun music, a “no holds barred” cacophony of roots energy that pushes the envelope of Cajun rock – with the ability to gracefully move from one end of that continuum to the other. Backing the greats of previous generations of Cajun music, as they do at the Ponderosa Stomp, their sound and approach cleaves much more closely to the traditional. Playing alone, however, some serious rock and roll chops quickly rise to the surface. This is even more visible on the second number, which begins with a precocious introduction on drums before being joined by screaming rock and roll vocals — with the slightest hint of colorful roots twang in lead singer’s Louis Michot’s voice. The Ramblers are a delight to watch on stage: jumping, twisting and swaying together – instruments all going full tilt at once, vocals more shouted than sung. For all their rock and roll fury, however, the Lost Bayou Ramblers clearly and consciously remain a Cajun outfit. Their fourth number is an excellent example of this, heavily driven by fiddle and accordion. The ensemble’s volume is brought down slightly between each chorus to highlight the glories of good Cajun fiddle work. Their intensity makes The Ramblers a delightful live show. On the fifth song in their showcase, I watch as the as the standing bassist plucks his instrument so aggressively and rapidly that I can’t actually see him making contact with the strings. As Louis Michot tightly grasps his microphone, mouth less than an inch away as he screams into it, he looks far more like his rock and roll peers than his Cajun ancestors. Their sixth number is one of the standouts of the set: a wild accordion-driven number with some impressive guitar work. This is a tune that owes more to more to Cajun and rockabilly than straight rock and roll. Both the fiddle and electric guitar pound out powerful, solid tones as moments where Cajun influence is crystal clear alternate with stints of glorious rockabilly. Cajun vocal stylings and an even more frenetic and manic ending than the two other versions. It is seems strange that a band could make a cover song and make it stand for what they’re all about – but, in this case, that is exactly what the Ramblers do. I believe that a truly good band can pull off any fusion of genres—a point well made by Goldrush earlier in the evening. Some fusions, however, are clearly more natural and seamless that others. Their mutual love of strings, energy and raw intensity makes rock and Cajun natural bedfellows (and I am always surprised there aren’t more bands at that nexus point). It also makes the Lost Bayou Ramblers a very loud band. Of all the acts I saw at SxSW 2012, the Ramblers are one of the few at which a made a conscious decision to take a few steps further away from the speakers. So, exhausted, ears ringing like a church bell, Doug and I slouch to our respective cars and return to our respective homes in hopes of catching a few hours of sleep before doing it all again. — The Sin City Social Club showcase at The Saxon Pub brought together Sons of Fathers, Mickey and the Motorcars, Shurman, Deadman, and BP Fallon and the Bandits. — The Nancy Fly Agency showcase in the Driskill Hotel’s Victorian Room assembled BettySoo, The Lost and Nameless Orchestra, MilkDrive, Warren Hood and The Goods, Guy Forsyth (see above), Ghosts Along the Brazos and Patrice Pike. * East Austin’s Carver Museum held a screening of “The Godmother of Rock and Roll” a documentary about Sister Rosetta Tharpe. * A showcase by Athens, AL’s Alabama Shakes transformed them into one of SxSW’s most talked about acts. * Ditto for rockers Titus Andronicus and their performance at the Brooklyn Vegan showcase at Bar 96. * Outlaw country legends Ray Wylie Hubbard and Billy Joe Shaver performed at the venue White Horse on Austin’s eastside. * Ex-Commodore and R&B/rock superstar Lionel Richey performed a set at Austin City Limits’ Moody Theatre. * Thomas Dolby, early electronica pioneer (of “She Blinded Me With Science Fame”) performed at The Jr.
* Punk icons Pennywise and reggae godfather Jimmy Cliff performed back-to-back sets at The Main. * The Parlotones, one South Africa’s premier rock groups, capped off a big night at the Loft. * Memorable Band Name Award: Gay Witch Abortion (Minneapolis Rock). Runners-Up: The Dikes of Holland (Austin rock), Dale Earnhardt Jr. Jr. (Detroit electronica) and We Were Promised Jetpacks (Edinburgh, Scotland rock). Goldrush were incredible. Not quite sure I’ve seen anything like them before.